Finding just the right page among the billions on the Web requires not only a search engine but also a bit of know-how. Here is a selection of my favorite tips for searching the Web. To search for an exact, complete phrase and not just its constituent words, put it in quotation marks. For example, instead of typing at sunrise on my birthday type ”at sunrise on my birthday”. The number of hits will shrink dramatically, as you’ll see only pages that include that exact phrase. If you want to find articles about managing bookmarks in Safari on an iPhone running iOS 7, don’t search for just manage bookmarks. Throw all those terms in: manage bookmarks safari iphone ios 7. The more information you provide, the more useful your results are likely to be. 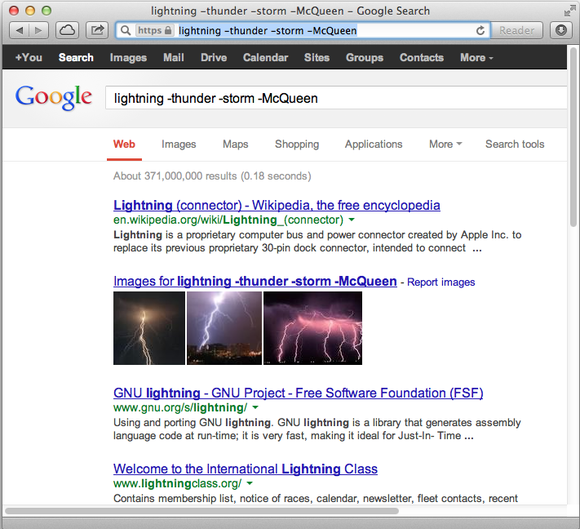 To make sure your search for information on the connector your iPhone uses doesn’t return matches about an atmospheric phenomenon or a fictional race car, put a hyphen (-) in front of terms that should disqualify a page from appearing in Google’s results—for example, lightning -thunder -storm -McQueen. Get more specific by excluding certain words from your search. If you visit Google.com in Google Chrome, you can click the microphone icon on the right side of the search field and speak your search terms out loud. As soon as you finish talking, Google displays matching results and sometimes offers a summary aloud. 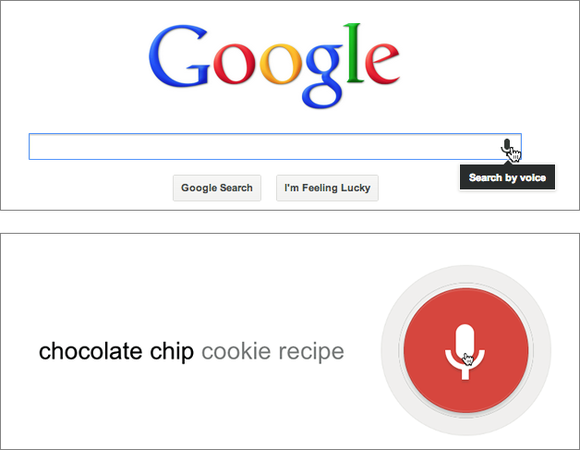 In Google Chrome, go to the Google homepage, click the microphone icon (top), and start talking. Whatever you say appears on screen (bottom), followed shortly thereafter by matching search results. 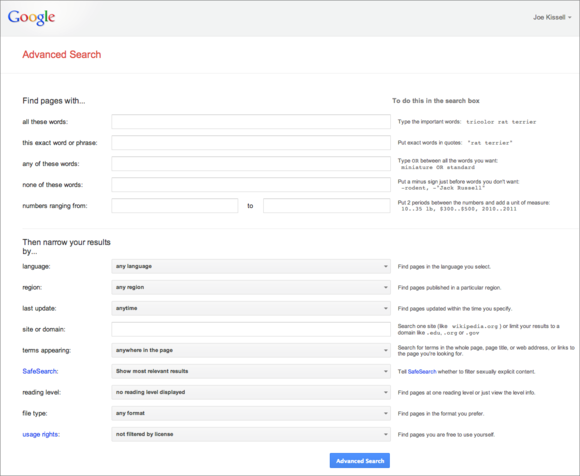 If you want much more control over your searches, such as specifying which geographic regions to search in, how recently created a page should be, or the page’s reading level, go to Google’s Advanced Search page or, after performing a basic search, click the gear icon in the upper-right corner of the results page and choose Advanced Search from the pop-up menu. Google’s Advanced Search page lets you fill out a form with options for a detailed, specific search. You can also use Google to find all sorts of information besides lists of webpages. Google can handle calculations (try 104 * 36.8), currency conversions (185 dollars in euros), time-zone conversions (time in Paris), weather forecasts (weather San Diego), word definitions (define: pedantic), and a great many other things. 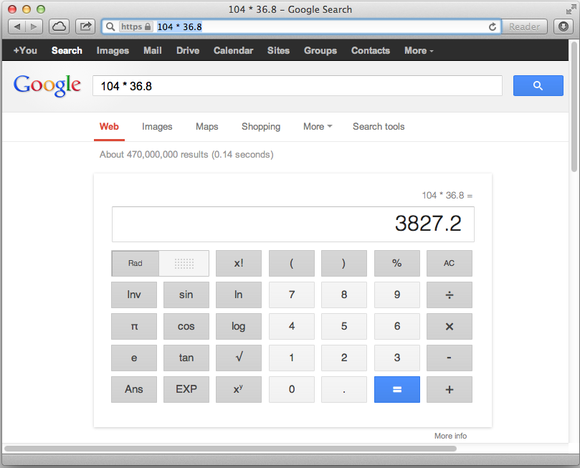 You don’t need a calculator (or a calculator app) if you have a browser open. A great place to learn dozens of additional tips for using Google is Google itself. For example, Google’s “Basic search help” and “Tips & Tricks” pages have loads of tricks and shortcuts you can use. And, depending on your browser, this sort of URL may also throw off your browsing history, making it difficult to see which sites you’ve been to. Luckily, you can solve this problem with a browser extension. My pick for Apple’s Safari is Shaun Inman’s free Detox. (It was originally designed for Twitter, but it works great for Google, too.) For Google Chrome, first install the free Tampermonkey, and then add the script Scrub Google Redirect Links. For Mozilla Firefox, try Wladimir Palant’s free Google/Yandex search link fix. Even the best Google search won’t help you find pages that Google hasn’t indexed, or items that are on page 5987 out of 28,001. If Google isn’t cutting it, you have alternatives. Competitors, including Bing, Yahoo, Ask.com, and DuckDuckGo, may point you to sites that don’t show up in Google. And because each search engine prioritizes search results differently, the page you’re looking for may be more prominent in one than in another. If you get stuck, trying the same search in another engine may do the trick. If you frequently need to search across multiple engines (and, perhaps, on highly specific databases that store information not indexed in general-purpose public search engines), you might be a good candidate for DevonAgent Pro (4 out of 5 rating), which can query many sites and services at once and summarize search results in a way that exposes connections between related concepts.